Peter is a renowned and experienced percussionist who performs, composes, teaches and judges percussion worldwide. As professional, Peter performed as percussionist in many world famous Musical productions including The Lion King, Tarzan, Copacabana, Sweet Charity, and the Wiz. He has worked with many international top musicians. Some Highlights include Mr Phil Collins, Simon Philips, Chris Hinze, international percussion group “Circle Percussion” (Japanese drums). This past 2 years Peter has been invited to major competitions and events to Judge, give workshops and master classes. Countries like Malaysia, Indonesia and many European Countries. Peter is a member of the international Jury of the PAS Italy Percussive Arts Society 2009-2010 for the international Percussion Competition Giornate della Percussione. Peter is a member of the “Dutch Expert team” for future developments for marching band activities in Europe. Specialized in the following instruments: Classical Percussion	:Timpani, Xylophone, Snare drum, Cymbals Glockenspiel, Solo Marimba. Light Music (pop)	: Drums. World Percussion	: Japanese drumming (Kodo style). Drum-Marching Band style: American rudimental drumming, European Style and “Pasveer style drumming” implements all European styles in one. 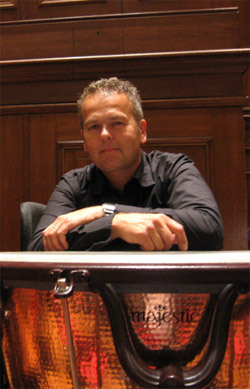 In 1987 Peter started his education at the Utrecht Conservatory and the Sweelinck Conservatory in Amsterdam. In 1994 he received his teacher and master degree in performing arts. During this period Peter performed with the Dutch Radio Chamber Orchestra, Radio Philharmonic Orchestra, Radio Symphony Orchestra, Metropole Orchestra and worked as percussionist with the “New Percussion group”, Amsterdam. In 1984 Peter went to the United States for one year where he continued his percussion education. He received “Best Student Award” in 1985 and State Champion with the Wildcat Marching Band in 1984. At the age of 7 Peter started to “play the drums” at the world famous “Pasveerkorps” in Leeuwarden, The Netherlands. His teacher at that time was Sjoerd Westra who taught him the first tricks of the trade of percussion. These lessons are still a great source of inspiration to Peter’s musical career. At the age of 10, his interest for percussion appeared to go further than just “drumming” and Peter started taking classes in classical and light music (pop) at the music school in Leeuwarden with master drummer and multi percussionist “Johan Faber”. In 1995 Peter started his own percussion school Slagwerkschool-Leeuwarden. Students from the age of 6 can start playing a wide variety of percussion instruments. This school is one of the most important parts of “The Percussion Factory”, a company started by him where percussion projects and events are produced. Examples are contributing performances for the opening of the Amsterdam Arena in 1996; International product introduction events for companies such as Volkswagen and BMW; “Pile Driver Concerts”, Open Air Spectacles with lots of “flash, fire and water”. Peter has also organized/performed several percussion projects and events in collaboration with the local theatre “DE HARMONIE”. Peter served his military duty at The Military Band “ Limburgse Jagers” in 1985/’86 as 1st percussionist/drummer. Besides performing, composing and teaching, Peter is the new managing director of Majestic Holland, B.V. part of the group KHS stationed in Taiwan which produces a variety of percussion products and where he managed, organizes demonstrations, clinics and workshops. Besides the thrilling Job as manager, the Roots as performer will stay. In this way Peter developed together with our International team many new ideas into the new line of Majestic Instruments. Works very close with the professionals in Live action. Quality of Sound, perfection and durability is for him a Major goal to achieve and keep on improving.